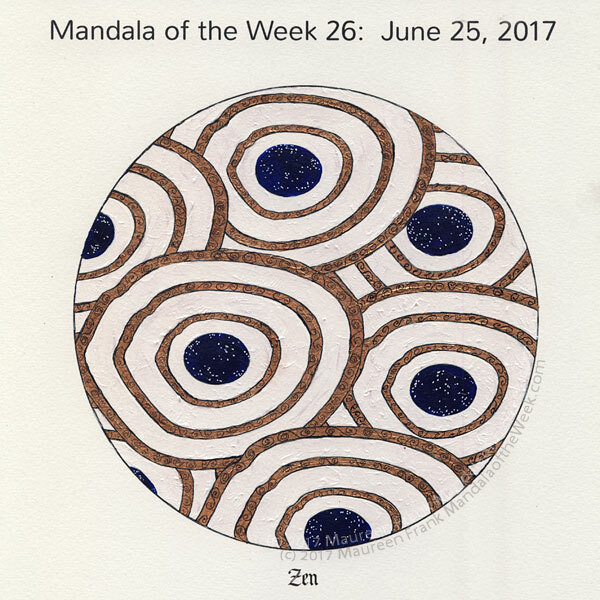 I present my coloring/painting of this week’s Mandala of the Week: Zen (from Sunday’s MotD post). While the center ovals were intended to represent rocks within a zen sand garden, when it came time to paint them, I saw them more as portals into outer (or inner) space. Sadly my scanner is unable to pick up the iridescent colors on the “white” bands or the shimmer of the copper paint used on the bands. The idea of Zen is to be focused, centered, and present in every given moment; to be in the nothingness to be able to experience everything-ness of All that Is. Coloring mandalas provides a way to do just that. For this painting, I used Liquitex and Golden acrylic paints, with a white gel pen and a fine black marker for the details. Soon I’ll be posting images of my progress through this painting on my ArtProgressions.com blog site.